There are lots of teachers around the internet publishing their own resources through blogs and ebooks and this form of fast self publishing can be overwhelming for readers, so it’s great to see a new magazine stepping into the role of mediating the quality of online content for teachers and helping new writers get the support they need to get published. 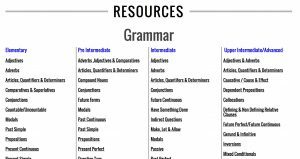 is the magazine for English language teachers. 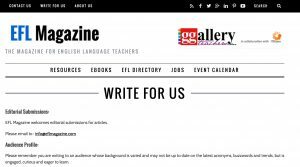 The goal of EFL Magazine is to bring great content from great people to English language teachers, worldwide. And to help those same teachers to inspire and empower students. Who is EFL Magazine designed for? 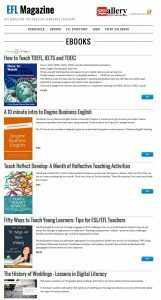 EFL Magazine is designed for those working in the English language teaching industry. Everybody from pre-service teachers to school managers and owners, support staff, recruiters and language learners. What inspired you to create an online magazine for EFL teachers? What made you think that EFL teachers needed another magazine and how do you feel EFL Magazine is different? Well, all our articles are free to access. We’re also focused on teachers around the world and not on a particular country or region. Some magazines are quite scholarly, but I wanted to make a magazine that was practical and could be used by the teacher in the classroom. I’ve seen and read other magazines and I’ve been very impressed by the writing. I think there’s a place for everyone and that competition is healthy. What’s the publishing cycle? Is it like a regular magazine with weekly or monthly issues? We publish 3 articles a week, and we’ll be increasing that to 4 articles over the next few months. What’s the focus of the main content of the magazine? At the moment, a lot of our articles are ‘how to teach’ but some of the other kinds of articles we run are book reviews, Interviews, articles on psychology, articles on ‘teacher conditions,’ recruitment articles and articles on CPD and education. We’re expanding and adding all the time. For instance, over the next few months we’ll be running a regular feature entitled ‘From the Student’s Perspective’ where we’ll be inviting students to offer their perspective on learning English. How do you decide who writes for the magazine? Can anyone submit an article? Within reason, yes. I’d love to hear from anyone who is involved in the world of teaching. I’ve had some articles from the bigger names, but I’ve also published articles from newer writers who’ve gained a lot of experience from working with the magazine’s editor Sean Newton. What would be your criteria for rejecting an article? Well if an article is ad hominem or potentially libelous we wouldn’t consider it for publication. On the other hand, I’d like debate within the magazine to be robust, and I won’t shy away from contrarian opinion. How big is your reader base? This month we received 16,000 visitors and we’re growing steadily month on month. You promote quite a few independently published ebooks on your site. How do you think these compare with the quality of books from the established publishers? The quality of ebooks I’ve seen are excellent and there’s a lot of great writers out there. As I said above, competition is healthy. It looks like everything on the magazine site is free, so how do you pay the bills? My day job is doing that at the moment. I am starting to get a trickle of advertising enquiries though. I have a number of plans I’m working on to monetise the site, but I believe the content comes first. If I focus on giving the reader as much value as I can in terms of articles they want to read and use, the readership will stay and grow. How do you see the future of EFL magazine 2 to 3 years from now? Well, I said when I launched the magazine that I wanted it to be the biggest magazine for English language teachers, in terms of readership. And while that’s still my aim, my real goal is to have a magazine that’s a treat for the returning or first-time visitor. 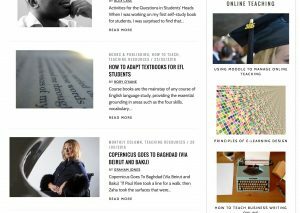 I envision the visitor coming to EFL Magazine and being awestruck by the range and quality of content on offer, then using what they’ve read to really make a difference, ultimately benefiting the student. If you were starting the magazine again next week, what you do differently? I’d definitely concentrate a lot more on SEO. I’ve just started to take this seriously, and It’s taking a long time to rejig articles to make them more SEO friendly. What’s the biggest challenge for you in managing the magazine? I used to think it was money. That is, if I had more money I could expand the scope of the magazine and offer far more to the readers. But actually it’s patience. If I keep persisting and listening to what the reader wants, EFL Magazine will grow. I just need to remain patient and focused on unending improvement. Do you foresee a time when you may produce a physical version? Why/not? Never say never! But seriously, I know that the trend is against print media, and producing a print magazine for a worldwide audience is challenging logistically, and costly financially. Having said that, I’m sure that it’s possible. Why not! Philip Pound is the founder of EFL Magazine. 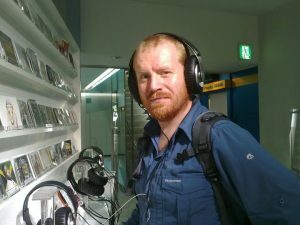 Apart from Ireland, Philip has lived in the U.K., China, and now Japan. He has had a variety of jobs throughout his career, Including being a chef, a cinema manager,and employed as a sales manager for a number of companies.Along with EFL magazine, Philip is engaged in a number of business ventures in the fields of recruitment, outsourcing and software development.